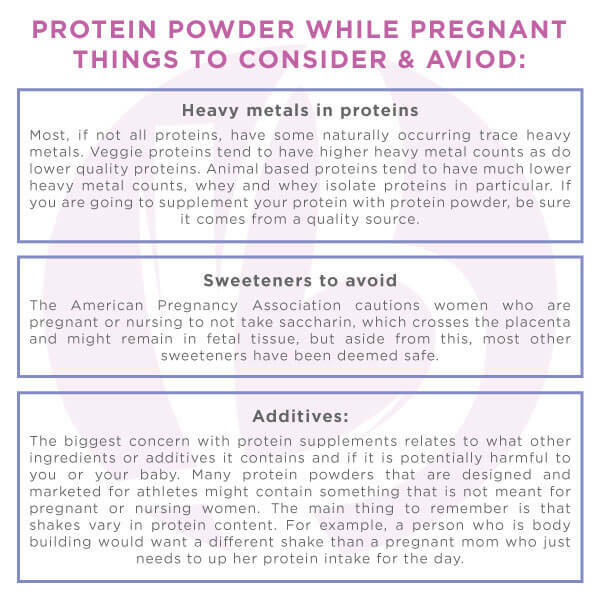 “Is it safe to use protein powder while I’m pregnant or nursing?” This is a question I am asked MULTIPLE times per day.(Seriously!) And I don’t blame new moms. When I became pregnant with my first son, I asked the same question as well! Experts recommend women who are pregnant and nursing to take a minimum of an extra 25 grams of protein a day. This means that during pregnancy, more protein-rich products must be consumed to help you and the growing baby in utero, but let’s be honest: this might be a tall order to fill for moms who have an aversion to meat, dairy, and fish. I couldn’t even stand the SIGHT of chicken for the first few months of both of my pregnancies. See my post on morning sickness below! Protein supplements are a great way to get that extra protein, but are protein shakes and powders safe during pregnancy? The short answer is yes, the long answer, is well, longer. The concern with protein supplements revolves around the type of sweetener used, how clean the protein is, and what other ingredients it contains. There is so much misinformation floating out there – especially about supplements and pregnancy. Are they safe? Are they dangerous? Ultimately, as moms, we are not only trying to stay healthy for ourselves, but we want to do what’s best for our babies. First, I want to preface this by reminding you that I am not a physician. Whenever you’re unsure, I always recommend talking to your doctor, your midwife, or pediatrician to get their professional opinion. Whey protein is a complete high quality protein and should be an acceptable protein source for healthy pregnant women and children, provided they are not allergic to dairy proteins. It’s actually really cool, because the second most abundant component in whey protein is alpha-lactalbumin which is one of the main whey proteins in human breast milk. Infant formulas often contain whey protein, including special formulas for premature infants. Click here to read more about the protein that I use (and love). Prior to taking whey protein, both pregnant women and parents of young children should consult a physician to be sure whey protein is right for them. Heavy metals in proteins: Most, if not all proteins, have some naturally occurring trace heavy metals. Veggie proteins tend to have higher heavy metal counts as do lower quality proteins. Animal based proteins tend to have much lower heavy metal counts, whey and whey isolate proteins in particular. If you are going to supplement your protein with protein powder, be sure it comes from a quality source. Sweeteners to avoid: The American Pregnancy Association cautions women who are pregnant or nursing to not take saccharin, which crosses the placenta and might remain in fetal tissue, but aside from this, most other sweeteners have been deemed safe. Additives: The biggest concern with protein supplements relates to what other ingredients or additives it contains and if it is potentially harmful to you or your baby. Many protein powders that are designed and marketed for athletes might contain something that is not meant for pregnant or nursing women (think: extra caffeine, creatine, etc). The main thing to remember is that shakes vary in protein content. For example, a person who is body building would want a different shake than a pregnant mom who just needs to up her protein intake for the day. Read the label to make sure the main focus of your shake is a high quality protein without additional stimulants, herbs, etc. Protein is an essential macro-nutrient, from the protein, fat and carbohydrate family. While protein is required by everyone for optimal health, protein matters even more so during pregnancy and lactation. Made up of amino acids, protein forms the building blocks of your body’s cells and that of your baby. The need for protein increases during the second and third trimesters of pregnancy, when your baby is growing at a rapid rate. Similarly, while breastfeeding your body’s demand for protein is 20 percent higher than when not pregnant or lactating. Protein is essential for the production of breast milk to nourish your growing baby. How well you eat during and after pregnancy will directly impact your health and that of your baby. Remember, protein shakes can be good protein and nutrient supplements to your diet if your doctor approves, but it is still best to consume your nutrients from real, whole foods. Lean meats, fruits, and vegetables are all excellent sources of the vitamins and minerals that you and your baby need at this time. Consult with your doctor as to how you can have a healthy and well-balanced diet for a smooth pregnancy and a healthy baby. In addition to a quality protein powder, consider other great sources of protein such as lean meat, poultry, fish and shellfish, eggs, milk, cheese, and yogurt. While animal products contain complete proteins (all nine amino acid components) and other plant sources generally don’t, eating a variety of foods throughout the course of the day will help ensure that you get all of the amino acids you need. Eat three or four servings of protein daily and you’ll be well on your way to eating right for a healthy pregnancy and baby. Your prenatal daily requirement of a minimum 70 grams as recommended by most doctors. Here are some good protein sources. In addition to the quality protein sources that come from whole food, you may consider adding a pregnant/nursing safe supplement that fits the guidelines above. I recommend Majka’s nourishing lactation powder for breastfeeding moms. It was created by moms for moms and it was designed to boost your energy, make you feel your best, and help support a healthy milk supply. As moms sometimes we don’t have time to eat or eat the right things which might result in low milk supply, fatigue, nutritional depletion, etc. With Majka’s protein powder for new moms you know that at least one meal a day you are taking care of the nutrients your body needs and getting some extra lactation support. USE COUPON CODE BEYONDFIT FOR 20% OFF! Want answers to some of the most commonly asked pregnancy questions? Attention moms! Get your body back in just 12 weeks! It’s time for you to burn the baby fat and get your body back. Check out my Beyond Baby Program and I’ll show you how! That’s right, if you’re a mom who’s ready to GET YOUR BODY BACK (no matter how old your baby is), you’re in the right place. Click below and I’ll reveal how busy moms like YOU can burn fat and get your body back – in less than 3 hours per week.